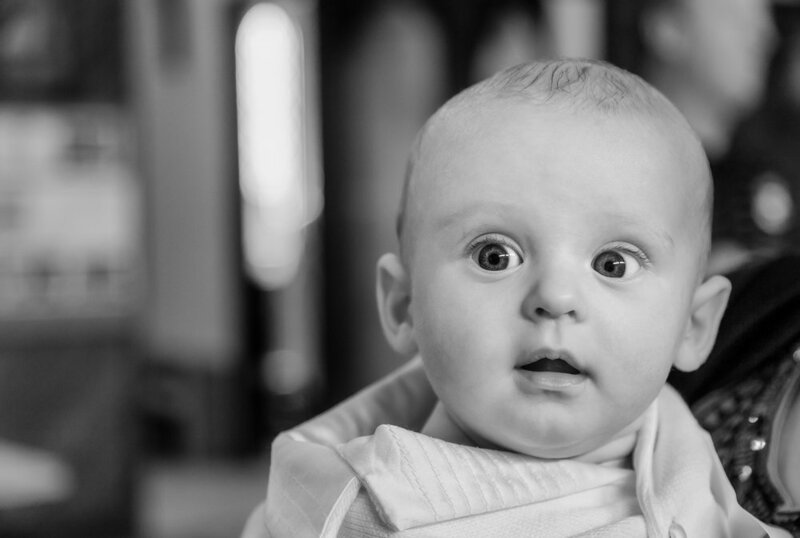 A lovely black and white photo of a baby boy gazing out of frame. Who’s got the cutest little baby face? Putting aside the beauty of your own face, or that of your pet, this is such a subjective question that the answer, should you meet the rather obvious criteria, may very well be your own baby. Now that’s established the question as to how to photograph your own prize and joy remains. I think a parent, most usually a mother, will identify certain behavioral aspects associated with their child and consider them as characteristics unique to that child. It’s certainly worthwhile trying to record such moments for posterity. But as far as recording a pleasing likeness a few fundamental elements need to be considered. A black and white portrait of a young boy in rural Bali, Indonesia. Soft, gentle light will help bring the face to life with beautiful, luminous light. You can achieve this with physically large light sources, both indoors and out. When inside one or more windows works a treat, while outdoors I’II often move my subject into the shade. But not too far into the jungle, just a meter or two inside the shade is usually enough. This allows light in, but at a lower level of intensity and in a softer, more diffuse form. As well as using light to bring the eyes to life, critical focusing on the eyes will further draw the viewer's attention. The application of a shallow depth of field will further enhance the effect by deemphasizing the out of focus surroundings. 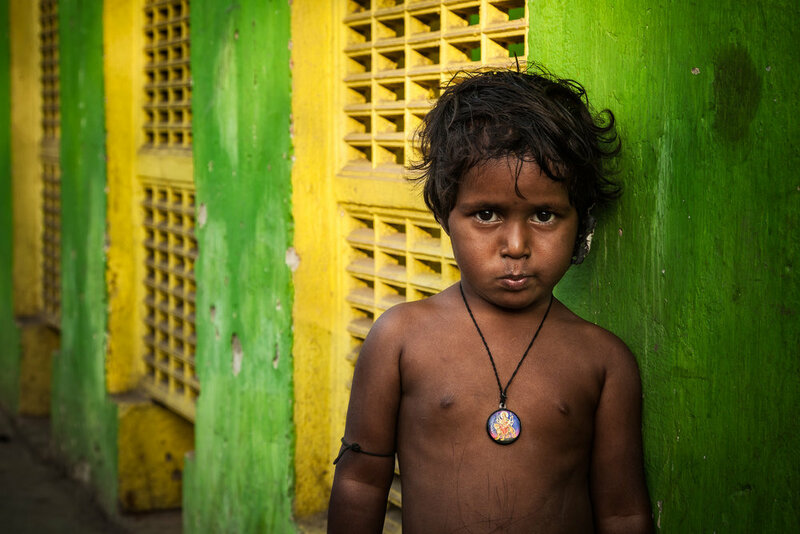 A striking portrait of a beautiful young girl in the grounds of a Hindu temple in Kolkata, India. It’s important to pay attention to all parts of the frame. In the case of a portrait I generally like to situate my subject against a background that’s darker than they are. This helps to bring out the shape of the head, particularly when the background is de-focused through a shallow depth of field. Once these fundamental aspects of light and composition are addressed it’s simply a matter of concentrating on expression and gesture. When it comes to portraiture, particularly of younglings, timing is the key. And you’ll be a position to preserve those special moments, in a way that’s fun for all involved, once you’ve attended to the fundamentals previously outlined. Photography, like so manny other things is as hard as you want to make it. This is one of the reasons why I rarely discuss equipment in my regular blog posts. These posts, for the most part, are about the art of photography of which equipment, while important, is by no means the be all and end all. Do you like classical piano music? How much of your listening experience is determined by your knowledge of the particular piano being played? Will owning the world’s best piano make a huge difference to the music you play if, in fact, you can’t play? Great Photography exists in the space between technique and experience. When it comes to performance there’s technique (e.g., what a rock guitarist might refer to as chops) and then there’s the more intangible concepts of feeling and emotive playing. I believe this site’s posts live in the space between technique and feeling. I like to call that space experience. And I'm not referring to learning over time, but of simply existing in the moment - much the way we do during heightened states of connectedness. I’m glad to be sharing that space with you now. You're welcome anytime.